This is exactly what the title says. This is a parody of the first book in the Gossip Girl series, but the weird thing is that the parody is written by Cecily von Ziegesar herself. I find this both courageous and extremely weird. It must feel uncomfortable to butcher your little baby book. Gossip Girl, Psycho Killer is heavier on the killer part than the Gossip Girl part. All the original characters are in it: Blair, Serena, Chuck, Nate, Jenny and Dan. The book loosely follows the original storyline, but adds massive slaughters and gross murders. I have to say, this book is pretty gruesome. If you’re not interested in horror, or if you are squeamish for blood or severed heads, don’t read this. This book isn’t really for hard-core Gossip Girl fans, it’s more for the fans of cheap horror flicks. I personally actually quite like horror. But even for me this was a little bit too much at times. It took me a very long time to get into the book, and to get into the dark humour. In the end, it was entertaining, and the adaptation from the original novel was very well done. I would recommend Gossip Girl, Psycho Killer but with a fair warning. Welcome to New York City’s Upper East Side, where my friends and I live, go to school, play, and sleep-sometimes with each other. It’s a luxe life, but someone’s got to live it . . . until they die. 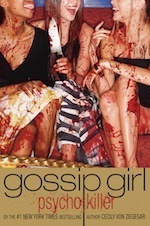 So begins Gossip Girl, Psycho Killer, a re-imagined and expanded slasher edition of the first groundbreaking Gossip Girl novel, featuring all new grisly scenes and over-the-top gore by #1 New York Times bestselling author Cecily von Ziegesar. Just as in the original story, Serena returns from boarding school hoping to make amends with her BFF Blair Waldorf–things just haven’t been the same since Nate Archibald came between them. But here’s where our dark tale takes a turn: Serena decides that the only way for her to make things right with Blair is to eliminate Nate. If that means killing him, well, c’est la vie. Her attempted murder doesn’t go unnoticed by Blair, however, who isn’t about to let Serena kill whoever she wants-not when there’s Cyrus Rose and Chuck Bass and Titi Coates and everyone else who’s ever irritated Blair to get rid of first . . . .
American Psycho’s Patrick Bateman has met his match in Manhattan’s newest, most fabulous trendsetting serial killers, Blair Waldorf and Serena van der Woodsen.